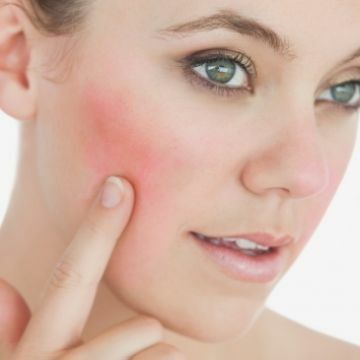 Rosacea is a chronic but treatable condition that primarily affects the central face. It can develop at any age, however surveys indicate it typically begins after the age of 30 as a flushing or redness on the cheeks, nose, chin or forehead that can come and go. Over time, this skin condition can become more persistent and visible blood vessels may occur. Left untreated, bumps and pimples may develop and in severe case, particularly in men, the nose may grow swollen and bumpy. Although rosacea can affect all segments of the population, individuals with fair skin who tend to flush or blush easily are believed to be at greatest risk. The cause of rosacea remains unknown and there is no cure, however its signs and symptoms can be controlled with medical therapy, lifestyle changes and cosmetic lasers. Common rosacea triggers include sun exposure, emotional stress, hot weather, wind, heavy exercise, alcohol, hot baths, spicy foods, and cold weather.